Photography is art and the photographer is the artist! When creating any art, the artist has to make decisions. The beauty of Photography is the ability of the photographer to experiment. With a large memory card, a variety of lenses, and ever changing light, the photographer can create a variety of photographs of the same subject. Many photographers don’t do this. Photographers that do call this technique “Working a Subject.” What this simply means is that the photographer is taking many photographs of the same thing in an effort to refine his/her vision. Ultimately the photographer wants to capture great images of the subject. To help you as a photographer capture better images, here are 3 photography tips for working a subject. My plan is to post several articles on this topic using different subjects so I can better illustrate the techniques I describe. In Part 1 we will use the St. Louis Arch as our subject. The first thing you can do as a photographer to work the subject is to find a unique angle of view. I’ve chosen the St. Louis Arch as my example on purpose for Part 1 because it is a well known, heavily visited, and well photographed subject. Even though this is true, we can still create wonderful images by finding a unique angle of view. Everyone shooting photographs of the St. Louis Arch wants to show the entire structure. We want to do that too but we also want to find that unique angle of view that most people don’t notice. My daughter and I walked straight under the arch and then got close to one end. Using a wide angle lens I then just shot straight up. St. Louis Arch from directly below for a unique angle of view. Nikon D80, Tokina 12-24mm @ 12mm; 1/400s @ f/4. We got strange looks from everyone else while we took photos of the St. Louis Arch from this angle. We were at the St. Louis Arch for several hours just exploring and enjoying our time. I never saw another photographer shooting from this angle. If you Google images of the St. Louis Arch you also don’t see this angle of view. That’s how I know it’s unique. 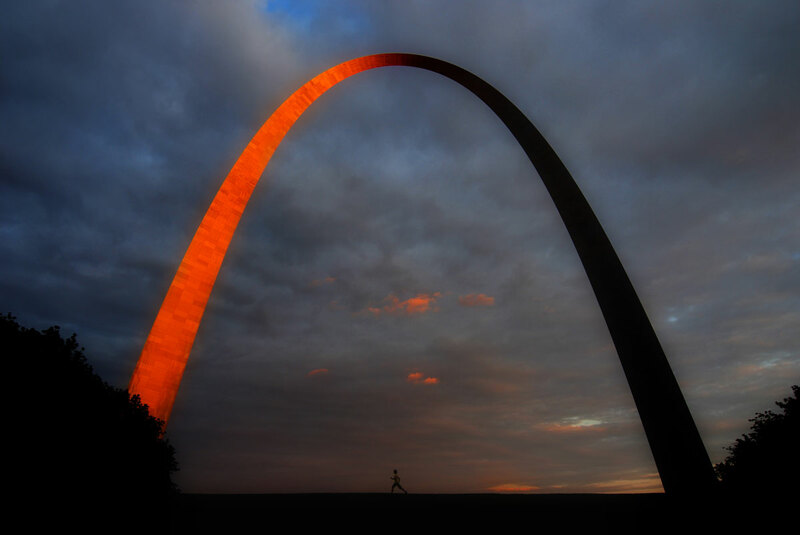 Is it the very best image of the St. Louis Arch? I don’t know. It’s not my favorite image by itself, but in a group of images of the St. Louis Arch it works because it is unique. In addition to finding a unique angle of view, you can also use different lens perspectives to help you create beautiful photographic images of your subject. As I mentioned above, the St. Louis Arch is a well photograph subject. While I was there my goal was to find and to create unique images of the St. Louis Arch that were different from images I had already seen. All of the images posted here were shot with the same lens which was a Tokina 12-24mm f/4 super wide angle. Even while using the same lens I could change the lens perspective by zooming. These next two images illustrate this technique. In the first image resume the with the lens all the way back to 12mm so that I could include the entire St. Louis Arch and some of the city in the background. My goal with this image was to allow the light to hit the flags in the middle to create some backlighting and to give the entire St. Louis Arch perspective with the city in the background. St. Louis Arch with flags and city buildings in background. Nikon D80, Tokina 12-24mm @ 12mm; 1/5002 @ f/5.6. In the second image, I wanted something different. In this image I wanted to show just a portion of the arch with people included. This gives the image scale and a different perspective than most people take photographs of. I underexposed the St. Louis Arch and the people to create a silhouette in an effort to simplify the composition. Again, by itself, this image may not be that powerful. However when shown with the other images the photo has context and is a unique and in my opinion a wonderful perspective of the St. Louis Arch. St. Louis Arch silhouette with people for scale and a different lens perspective. Nikon D80, Tokina 12-24mm @ 24mm; 1/500s @ f/5.6. While the first 2 tips involve things the photographer can control and change, the third tip is to simply have patience and wait for the light. Sometimes as photographers we get in such a hurry to make our images and then move on that we forget that photography is all about light. As a photographer, you can only create beautiful art when you Find the Right Light for your subject. Usually this requires patience while the light changes. As an example, compare the two images below. There are many images of the St. Louis Arch with sunlight and a beautiful blue sky with clouds. However, even after Googling images, I never found another photograph that has a refracted sun burst of light in it. That was one of the images I had imagined in my mind that I wanted to create before I even went to the St. Louis Arch. Once I found the right angle with the lens I had, all I needed to do was wait for the sunlight to strike the arch in the right spot. Because of patience, I was able to Find the Right Light. St. Louis Arch with sun burst reflecting once the sunlight hit the right spot. Nikon D80, Tokina 12-24mm @ 16mm; 1/320s @ f/5.6. Another image was also created in my mind before I even went to the St. Louis Arch. I knew I would have my daughter with me and that I could use her in a way that would help me create scale for the St. Louis Arch. But, that wasn’t enough, I wanted something more in the photo. I knew that if I waited for the right light and if the weather would cooperate I could get beautiful orange sunset light reflected from the shiny surface of the St. Louis Arch. My daughter and I found a likely spot and I took a photo of the setup to make sure I had the right location and angle. St. Louis Arch test photo to make sure I had the right location and angle. I had my daughter run back and forth to check everything. Nikon D80, Tokina 12-24mm @ 16mm; 1/160s @ f/8. My daughter and I went and had dinner and then came back to the location I had already scouted. Then we simply waited. When the Right Light began to appear I had my daughter run back and forth again under the St. Louis Arch. My goal at this point was to catch her in the right stride to create a dynamic and powerful image of the St. Louis Arch. St. Louis Arch with sunset light reflecting off shiny surface. My daughter is running underneath to provide scale create dynamic energy in the photo. Nikon D80, Tokina 12-24mm @ 16mm; 1/60s @ f/6.3. Once again as I was taking photographs, people were looking at me strangely. I guess I’ve kind of gotten used to it because at this point I didn’t even really care. The light was beautiful and I was creating just the image I wanted. There is no one technique in photography that works for every subject. However, I am convinced from my own experiences, that when I look for a unique angle of view, try different lens perspective, and wait for the light, I can work my subject and can create powerful images. When that happens I am filled with excitement. When you use do these things, you too can create the images you want. I will do several more posts on this topic with different subjects to illustrate how this works. For now, get out there and Find the Right Light.